When scooped up from a pond or still water source Oedogonium will adhere to your hand, rather than slip through your fingers. 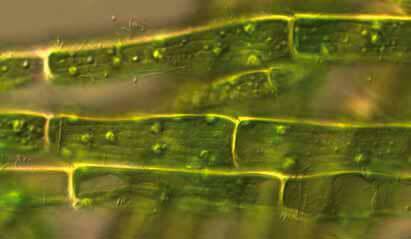 Oedogonium is a filamentous green algae with filaments that are only one cell thick. 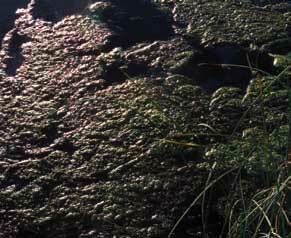 This type of algae is occasionally free-floating, but is often attached to other aquatic plants. Oedogonium thrives in fresh water that is not disturbed. When Oedogonium is viewed under a biological microscope, the single cell filaments are more visible. If this algae becomes out of control in fresh water environments the water is often treated with copper to limit its growth and keep it from invasively overtaking the pond.